Test if your inverter is bad or your CCFL bulb in the LCD sceen is bad. Experts Exchange > Articles > Test if your inverter is bad or your CCFL bulb in the LCD sceen is bad. I WILL CONCENTRATE ON LCD SCREEN INVERTOR , CCFL BULB PROBLEMS. 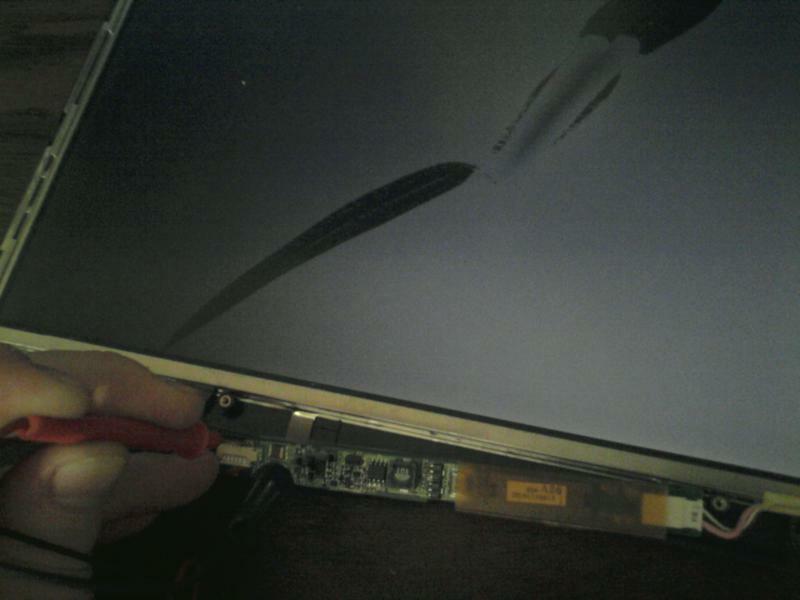 The old question "My laptop screen is black what can it be ?". 1. INVERTER BOARD IS BAD. 2. 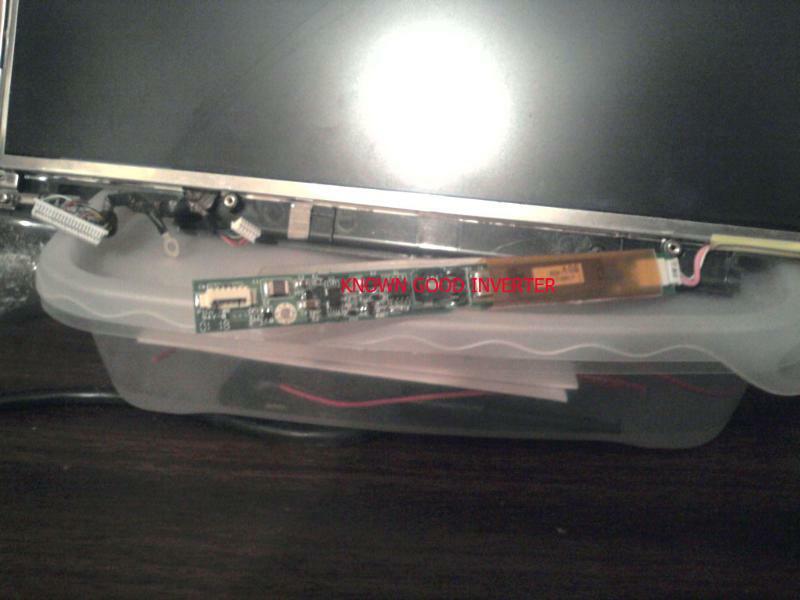 CCFL BULB IN LCD SCREEN IS BAD. 3. NO VIDEO TO THE LCD SCREEN. TOOLS YOU WILL NEED FOR THIS PROJECT. 2. 9V BATTERY POWER CORD. ONCE YOU HAVE ACQUIRED THE TOOLS YOU WILL NEED YOU CAN PROCEED. 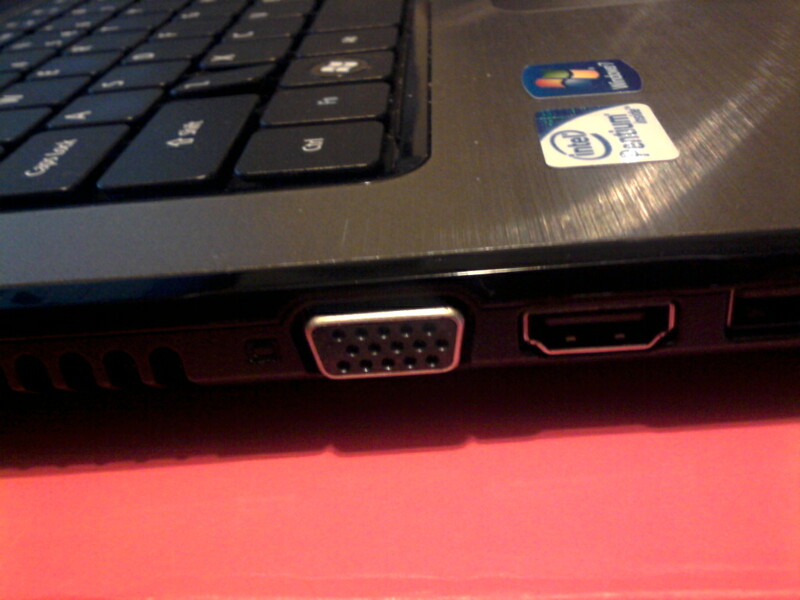 IF YOUR LAPTOP IS EQUIPPED WITH AN VGA EXTERNAL MONITOR CONNECTOR YOU CAN DO A QUICK CHECK FOR VIDEO. SIMPLY PLUG A EXTERNAL MONITOR IN TO YOUR VGA PORT AND CHECK IF YOU GET VIDEO ON YOUR MONITOR. SOME LAPTOP REQUIRE YOU TO PRESS A FN KEY PLUS A KEY WITH A PICTURE OF A MONITOR TO SWITCH BETWEEN YOUR LCD LAPTOP SCREEN AND YOUR EXTERNAL MONITOR. NOW WE CAN USE OUR KNOWN GOOD INVERTER AND 9V BATTERY TO DO A QUICK CHECK TO SEE IF OUR COLD CATHODE FLUORESCENT BULB IS WORKING. UNPLUG THE LAPTOPS INVERTER AND PLUG IN OUR KNOWN GOOD INVERTER. 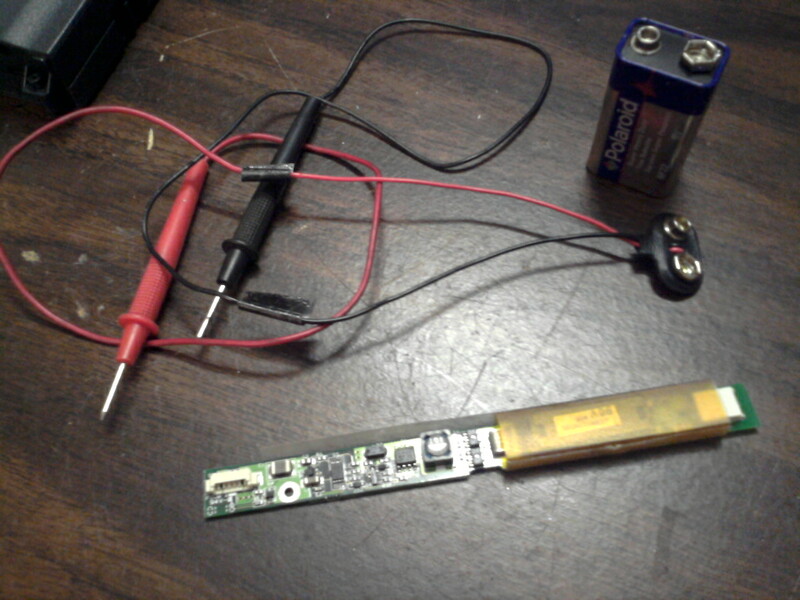 AND THE RED PROBE TO THE YELLOW WIRE PIN ON THE INVERTER. 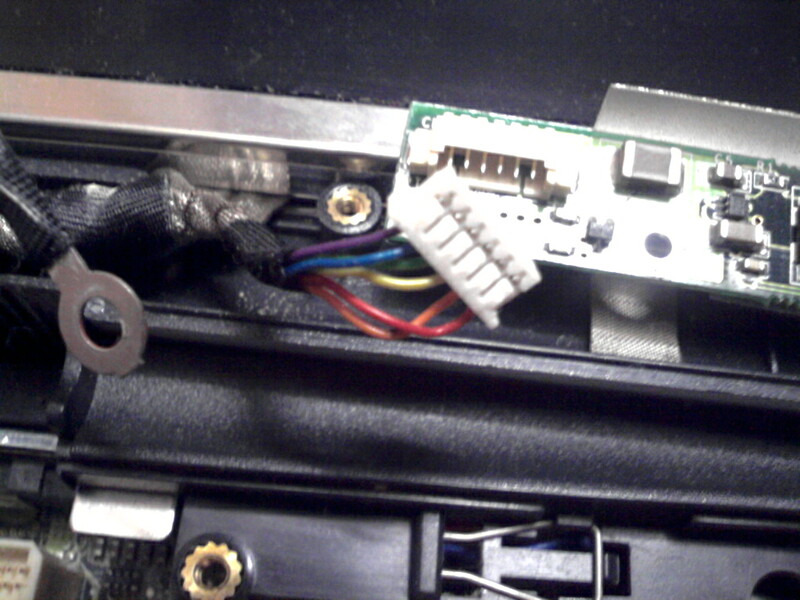 THE YELLOW WIRE IN LAPTOPS IS 12V . THIS ONE IS THE SUPPLY LINE TO THE INVERTER FROM THE LAPTOP. OUR 9V BATTERY WILL WORK JUST FINE TO TEST OUR INVERTER AND CCFL LIGHT WITH. IF YOU ARE NOT SURE WHICH ONE IS THE SUPPLY LINE WHEN YOU FIRST FIND YOUR OWN KNOW GOOD INVERTER JUST PUT THE BLACK PROBE TO THE GROUND HOLE SCREW AND TOUCH THE RED PROBE TO EACH PIN ONE AT A TIME UNTIL YOU SEE THE LCD SCREEN CCFL BULB LIGHT. IF YOUR CCFL BULB LIGHTS UP LIKE IN THE PHOTO BELOW THE YOU KNOW YOUR CCFL BULB IS GOOD AND NOW CAN SUSPECT THE INVERTER IS BAD. THE SCREEN IN THIS IMAGE IS AN OLD BROKEN SCREEN BUT WILL SERVE WELL AS OUR DEMONSTRATION IMAGE. SINCE OUR KNOWN GOOD INVERTER LIGHTS UP THE SCREEN THEN WE CAN PLUG IN THE LAPTOPS INVERTER BACK IN. YOU CAN USE THE SAME METHOD WITH THE 9V BATTERY TO TEST THE LAPTOPS INVERTER IF YOU SUPPLY THE INVERTER WITH 9V FROM BATTERY AND THE CCFL BULB WILL NOT LIGHT THE YOU CAN SUSPECT THIS INVERTER IS BAD AND NEEDS REPLACED. 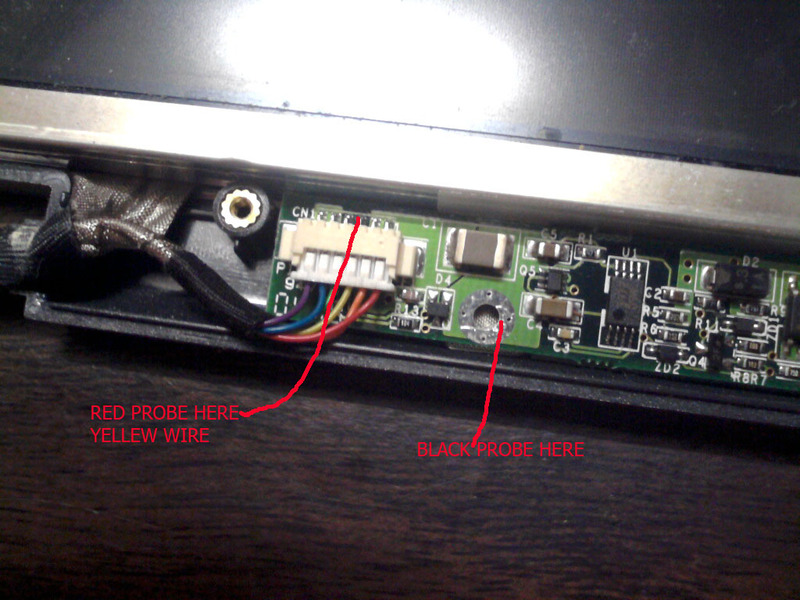 THEN YOU WILL NEED TO SUSPECT THE 12 VOLT SUPPLY LINE FROM THE LAPTOPS MOTHER BOARD FOR VOLTAGE. GET OUT YOUR MULTI METER . SET IT TO DC VOLTS. PLUG IN AC ADAPTER AND TURN LAPTOP ON. PLACE BLACK PROB TO A GROUND SCREW ON THE MOTHER BOARD AND THE RED PROBE TO THE YELLOW WIRE AND SEE IF YOU HAVE YOUR VOLTAGE. YOU CAN ALL SO PLUG IN THE CONNECTOR AND CHECK THE PIN COMING OUT FROM THE YELLOW WIRE FOR AROUND 12V. IF YOU ARE NOT GETTING ANY SUPPLY LINE VOLTAGE FROM THE CONNECTOR THEN SUSPECT A PROBLEM ON THE MOTHER BOARD. AT THIS POINT YOU WILL NEED TO TAKE THE UNIT TO THE REPAIR SHOP.